Perrenial, often grown as an annual, with solitary flower heads in a range of colours, white, yellow, orange or red. Album has white flowers. To 90cm. [RHSD, Hortus]. Grandiflorum is probably, as the name suggests, a form with larger flowers. Introduced to Britain in 1799. [PD]. ‘This large and extremely ornamental species, was raised by Mr. Low of Clapton, from seed sent from Swan River by Mr. Drummond, late of Cork, and seedlings, sent to the garden of the Caledonian Horticultural Society in October, 1839 , flowered very abundantly during July and August following, forming an exceedingly attractive border plant. The species has proved to be perennial, pushing, in the year after flowering, many branches from the lower part of the stem. It has not ripened seed at Edinburgh. 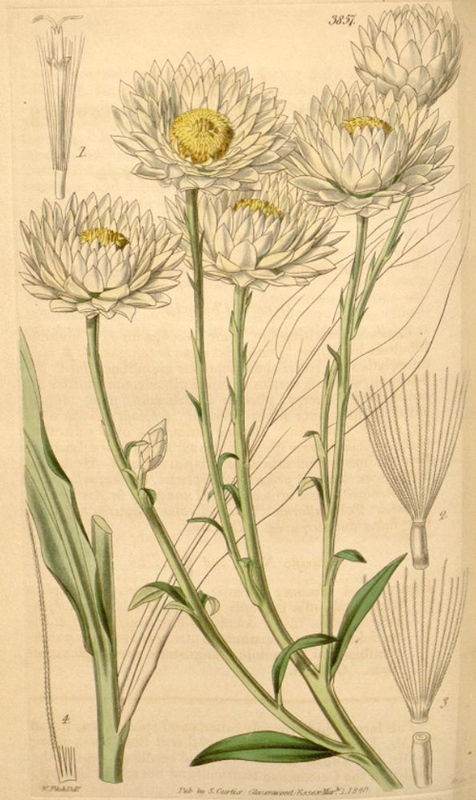 It has much affinity with the H. macranthum of Bentham, but is distinguished by its large capitula, pure white, cup-shaped involucre, and perennial root. It is in the highest degree worthy of cultivation.’ [BM t.3857/1841 as H. niveum]. 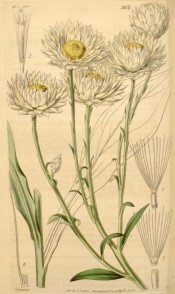 Helichrysum album N.E.Br. (1895) is not Macarthur’s plant.